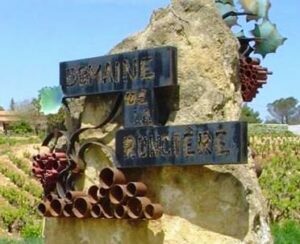 Domaine de la Ronciere came into being after Luis Canto moved from Spain to Chateauneuf du Pape. Ten years later, because the owners did not have children they sold Luis Canto the Southern Rhone vineyard in 1958. In 1979, Jean Louis Canto took over management of Domaine de la Ronciereha. The family tradition continued in 2002 when the third generation stepped in with Geoffrey Canto. Domaine de la Ronciere has 11 hectares of vines spread out in different sectors of the Chateauneuf du Pape appellation. 10 hectares are used to grow grapes for the production of red Chateauneuf du Pape wine. 1 hectare is reserved for planting white wine grape varietals. All the work in the vineyards is done using only biodynamic farming techniques. In 2013, Domaine de la Ronciere was certified as a biodymamic producer by the Agriculture Biologique. Domaine de la Ronciere also owns 13 hectares of vines in the Cotes du Rhone appellation and 6 hectares of vines classified as IGP. Domaine de la Ronciere produces 1 red Chateauneuf du Pape wines and 1 Chateauneuf du Pape Blanc. Domaine de la Ronciere Chateauneuf du Pape Classique comes from 85% Grenache 10% Syrah and 5% Mourvedre.The wine is aged for about 17 months in cement vats. Production averages 1,800 cases per year. Domaine de la Ronciere Flor du Ronce is produced from 90% Grenache and 10% Syrah. The wine comes from a 3 hectare parcel of old Grenache vines that are close to 70-years of age. There is no destemming of the grapes. The wine is aged in a combination of some new, French oak barrels and used French oak barrels. On average, about 500 cases are produced each year. Domaine de la Ronciere Cuvee Jacquerie is made from an even blend of 50% Grenache and 50% Syrah. The vines used for this wine are old with an average age of 100 years. The yields as you can image are old at close to 16 hectoliters per hectare. The wine is aged in 100% new, French oak barrels for an average 18 months. About 110 cases are made in each vintage. Domaine de la Ronciere Louis Geoffrey is produced with 80% Grenache and 20% Syrah. The fruit comes from vines that are on average 70 years of age. The wine is aged in a combination of 20% new, French oak barrels and the rest of the wine is aged in cement tanks. On average, 650 cases are produced each year. Domaine de la Ronciere Chateauneuf du Pape Blanc is a blend of 50% Grenache Blanc, 25% Clairette and 25% Bourboulenc. Less than 300 cases are produced each year. Domaine de la Ronciere can be enjoyed on the young side with 1 hour or so of decanting. This allows the wine to soften and open its perfume. Older vintages might need very little decanting, just enough to remove the sediment. Domaine de la Ronciere is usually better with 2-4 years of bottle age. Of course that can vary slightly, depending on the vintage. In the best vintages the wine should be consumed within 3-10 years after the vintage. Domaine de la Ronciere is best served at 15.5 degrees Celsius, 60 degrees Fahrenheit. The cool, almost cellar temperature gives the wine more freshness and lift. Domaine de la Ronciere is best served with all types of classic meat dishes, veal, pork, beef, lamb, duck, game, roast chicken, roasted, braised, stewed dishes, sausage, barbecue, grilled meats, and cassoulet. Domaine de la Ronciere is also good with Asian dishes, hearty fish courses like tuna, mushrooms, cheese pasta, eggplant and tomatoes. The white wine of Domaine de la Ronciere is best served with a myriad of different seafood dishes, shellfish, crab, lobster, sushi, sashimi, chicken, pork and veal, as well as Asian cuisine. Domaine de la Ronciere also produces 2 wines in the Cotes du Rhone appellation and a rose’ wine. Fresh, soft and polished, dark, red fruits and silky tannins make this a very nice wine. Sweet and spicy, with an open, peppery, dark red berry, elegant personality. Powerful, long, ripe and filled with layers of sweet, fleshy berries and toasted oak, which is going turn off some tasters, due to its modern stylings. Light, sweet and fresh in style, the wine delivers sweet and tart red fruits. This is best enjoyed in its youth. Forward, medium bodied, with a touch of oak in the sweet, lush, round, black raspberry, kirsch and earthy, garrigue character.